On July 19th, 2017, a theft occurred at the Petro Canada in Virden MB. 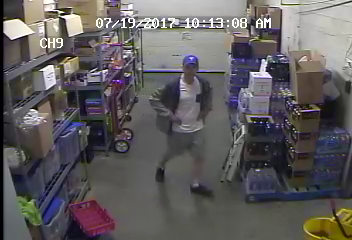 An unknown male entered the Petro Canada, and after walking around and realizing there was only one employee working, he entered the “Staff Only” office and proceeded to steal several cartons of cigarettes. The suspect entered and exited the building three times, each time leaving with a garbage bin full of cigarettes. The suspect is described as male, Caucasian, in his 30s to 40s, and approximately 173cm tall with a slim build. If you have any information about this incident, please contact the Virden RCMP Detachment at (204) 748-2046 or submit a tip.